On Wednesday of this week (May 2), farmers will gather at the Nickels Soil Lab in Arbuckle for the 30th annual Nickels Field Day, one of the most popular annual field day events held by UC Cooperative Extension. 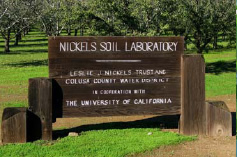 The Nickels Soil Laboratory was created by Arbuckle farmer Leslie J. Nickels. When he passed away in 1959, Nickels had no heirs or close family. He made provisions to donate his estate for agricultural research, specifically naming the Regents of the University of California and the Colusa County Water District as administrators. The primary crop on the 200-acre research facility in Arbuckle is almonds. Numerous research projects have been conducted on variety selection, nutrition and pest control, but the predominant breakthrough was in the application of drip irrigation. During the field day, researchers will make eight presentations, on such topics as organic almond production, selecting rootstocks, new almond varieties and weed control strategies. After lunch, participants will see a mechanical tree planting demonstration.  Click here for an event flyer that includes a map to the Nickels Soil Lab. National Public Radio reported this morning that a judge in San Francisco will today consider whether to extend a temporary ban, imposed in February, on planting and selling of Roundup Ready alfalfa. U.S. District Court Judge Charles Breyer ruled that the USDA didn’t follow federal laws when it approved Roundup Ready alfalfa without conducting a full Environment Impact Statement. To provide accurate, scientific information about biotechnology, the UC Agriculture and Natural Resources biotechnology workgroup crafted 15 fact sheets outlining the basics on the production and safety of genetically engineered crops, foods, animal feed and animals. The fact sheets were a first step in helping farmers opposed to the technology and those in favor of it to step back from the controversy and successfully produce and market their crops in the way they personally see fit. Click here for a news release with links to the fact sheets. I have always considered the UC Lindcove Research and Extension Center the most beautiful of UC’s agricultural research centers in California. Bright green citrus trees laden with orange and yellow fruit contrast with a backdrop of rocky foothills and the towering Sierra Nevada Mountains. On a clear day, from the top of the center's highest slopes, the San Joaquin Valley's agricultural patchwork meets the Coast Mountain Range in the distance. All of the RECs have something lovely to offer, but my visit to the Hopland Research and Extension Center yesterday gives it the top spot on my list of personal favorites. At the 5,300-acre center -- where research focuses on sheep production, rangeland management and watershed maintenance -- tremendous, majestic oak trees, with moss swaying like curtains in the breeze, stand guard over emerald green hills, pastures, rangeland and vineyards. In this beautiful setting, UC advisors are monitoring sheep as they graze peacefully in vineyard test plots. The outcome of the research will give grape growers the information they need to decide whether to use this environmentally friendly weed control system. The next two days I will be in the field gathering ANR news, so will not be able to post to this increasingly popular ANR news blog. Tomorrow I'll attend the "Methods of Fruit & Vegetable Flavor Analysis Workshop" at UC Davis. The event is coordinated by UC Davis enology professor Sue Ebeler and UC Cooperative Extension specialist Diane Barrett. The resulting story, which I plan to post on May 1, will cover UC's role in researching and developing human and instrumental flavor perception for the fresh and processed fruit and vegetable industries. On Wednesday, I'll be at the UC Hopland Research and Extension Center, just south of Ukiah, to collect information on farm advisor Morgan Doran's research on non-chemical weed control in vineyards. He is trying to develop an aversion to the taste of grape leaves in sheep (by inducing a stomach ache with lithium chloride after they munch on grape leaves). Once these sheep have learned to avoid grape leaves, they could cleanup weeds without hurting the vines. If all goes as planned, this story will be posted on the ANR news Web site in mid-May with video and high-resolution photos. A link to the ANR news RSS now appears on the news Web site. Just click the orange button at the bottom of the left navigation bar. That takes you to a page with the address of the news RSS. If you add that address to your RSS reader, you will receive headlines and summaries of ANR news releases whenever they are posted to the ANR News Web Site. 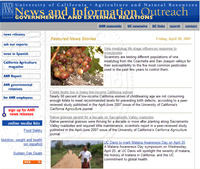 Today, I posted a story from IPM's Stephanie Klunk about vine mealybug and two stories, authored by California Agriculture Journal managing editor Janet Byron, covering research reports in the most recent edition of the journal. One of the stories outlines the fact that folate levels are low in low-income women and the second reveals that native grasses persist for a decade on Sacramento Valley roadsides.